An Oklahoma Wal-Mart store is holding a food drive for its own employees, according to labour organisers. The group Making Change At Wal-Mart posted a photo of the food drive to its Facebook page on Thursday. The photo shows a cardboard bin with a sign attached that reads: “Let’s succeed by donating to employees in need!!! Thanks for your support!” Another sign reads: “3430 canned food drive!” The number “3430” refers to the supercenter store on Northeast 23rd Street in Oklahoma City. The photo was taken by a Wal-Mart employee who wishes to remain anonymous for fear of retaliation, according to the labour group, which has been pressuring Wal-Mart to raise its wages. A manager at the store directed Business Insider to Wal-Mart’s corporate office for questions regarding the food drive. Wal-Mart faced widespread backlash last year when it was reported that a store in Cleveland was holding a similar food drive to help employees pay for Thanksgiving dinner. Critics argued that the company’s wages are too low if its employees need help paying for food. 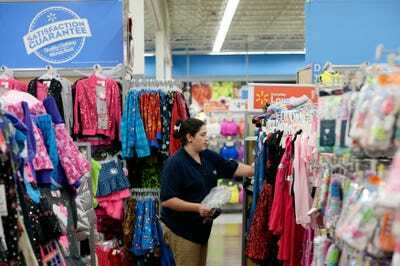 ReutersA worker stocks merchandise at the Wal-Mart Superstore in Los Angeles. Wal-Mart spokesman Kory Lundberg told Business Insider last year that the food drives have been going on for several years. “This store has been doing this for several years and [it] is for associates that have faced an extreme hardship recently,” Lundberg said, referring to the Cleveland food drive. The average hourly wage for Wal-Mart’s full and part-time employees is $US11.83, according to the company. OUR Wal-Mart, a group that’s fighting for higher wages at Wal-Mart, claims that most workers make under $US9, based on data from IBISWorld and Glassdoor.com. The minimum wage in the U.S. is $US7.25 an hour.